In 1987 Honda released the first generation Legend as the top of the line for their newly launched Acura division in North America. The Legend was also sold as the Rover 800-series in part of a collaboration between Honda and the Austin Rover Group, but the Rover badged variant always scared me due to the looks you get when you tell the parts counter guy at PepAutoKragReillys that you have a "Rover." A Ranger Rover? No. A Land Rover. NO -- ROVER, just a Rover. 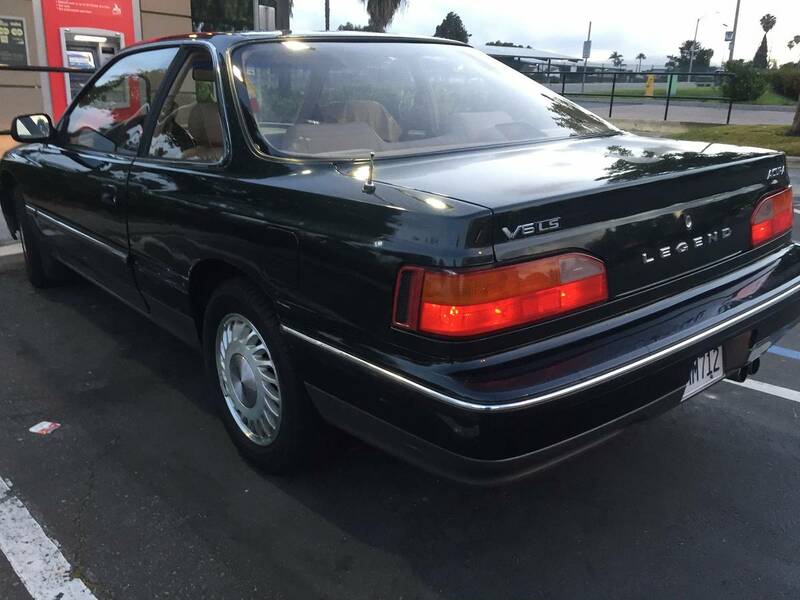 Save yourself the screaming and buy this 1989 Acura Legend LSV6 offered for $3,000 in Chula Vista, CA via craigslist. Tip from FuelTruck. The original Legend isn't as stylish as the later versions, but they helped solidify Honda's reputation as a manufacturer of dependable luxury goods. Interestingly enough, the introduction of the Acura brand was an attempt by Honda to make more money under the voluntary export restraint that was set in place (1.68 million cars in 1981, increasing each year through 1995) to limit Japanese cars on the US roads. The labor unions and domestic automakers that had lobbied hard to limit influx of Japanese economy cars had inadvertently forced Honda/Toyota/Nissan to launch Acura/Lexus/Infiniti into the higher end market, ultimately dooming Pontiac, Buick (how did Buick survive 2008?) Mercury, Plymouth, Oldsmobile, and countless union jobs. Honda's C27A V6 engine pushes out 161 horsepower from its 90 degree 2.7 liter arrangement into a front mounted 5-speed transaxle. The V6 Legend is a decent handling car for a front-wheel-drive 80s platform and is supremely reliable. 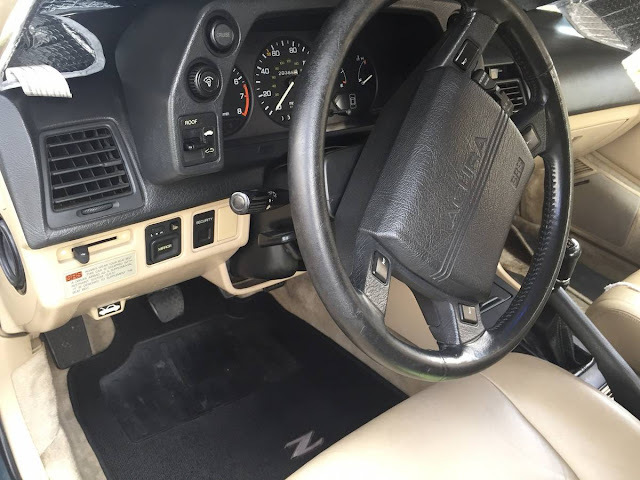 Had an 88 4 door LS 5 speed and put almost 300k miles on it with minimal problems. These do have a hydraulic clutch which can be problematic (i.e. problems can be in the clutch or the hydraulics). They also need frequent oil changes to avoid hydraulic lifter noise. Otherwise, a very comfortable and responsive driving experience. It's in good shape for high mileage. 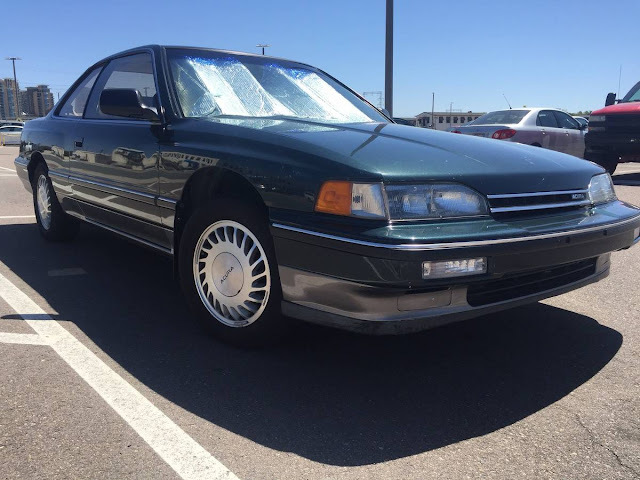 It's funny...back in '86, both the Ford Taurus and the Acura Legend (sedan) had just hit the market. And for some reason that escapes me now I ended up driving both in the same day. What I recall is that the Honda was a much better 'trimmed' car, no rough edges, but gutless. The 3-liter Taurus, on the other hand, was a little more ragged but more fun to drive. If that driver's seat has never been refinished, it needs to be put in a museum. I've never seen original leather on one of these that didn't look like it had been a pit bull's chew toy. As I recall, a big part of the problem was that the EPA began mandating spray-dyed leather vs the better vat-dyed method for finishes, and the Japanese manufacturers of the time seemed to have a harder time than most with the process. Could be some errors in that memory, just what I recall. Also, not to be pedantic, but I can see the parts guy's consternation if you said it was a "Rover". Now if you had called it by it's actual US name of "Sterling", it may have come up in the system. They'd still have no parts for it, but they'd recognize the name. 87 4dr 5spd, bought it with 100k miles back in 93, everyone thought I was insane paying $6k for it.. Drove it for 10 years and sold it for $2k with 455k miles.. Traveled to all corners of the US with it.. Never broke except the common clutch slave, still managed to get it home from CO to MI rev matching... Best car ever, but wished it had the 2.7L ..